Dictaphone 0POWM2S-005 PowerMic II with Barcode. Dictaphone PowerMic is an ergonomic, noise-cancelling microphone with buttons for familiar dictation controls (e.g. Play, Rewind, Record, etc) as well as navigation through the software. USB design makes the microphone plug-and-play ready while eliminating the need for a PC sound card. Integrated high quality bar-code scanner. Dictaphone PowerMic is an ergonomic, noise-cancelling microphone with buttons for familiar dictation controls (e.g. Play, Rewind, Record, etc) as well as navigation through the software. USB design makes the microphone plug-and-play ready while eliminating the need for a PC sound card. The Dictaphone PowerMic puts all functions in the physician’s hand, offering complete control using a familiar interface that’s many times easier than navigating telephone keys. move throughout recognized text reports for review and editing. 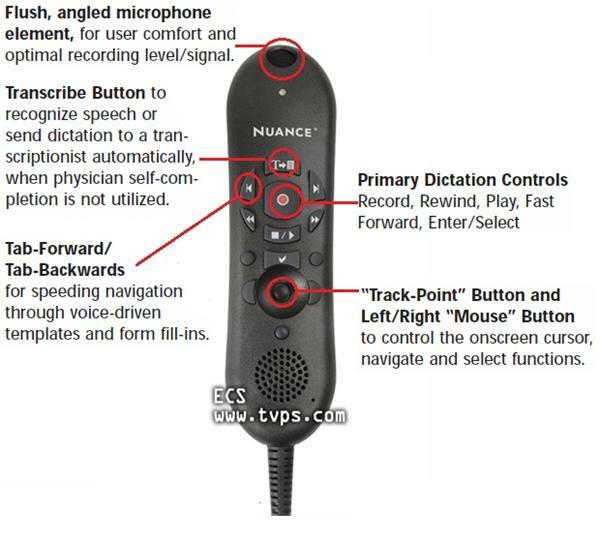 In addition to complete dictation control, the PowerMic II incorporates full-function, Microsoft® compatible, PC-Mouse capabilities into the hand microphone, to reduce the need for care givers to have continually move between the microphone, mouse and keyboard. With the PowerMic II, users have the ability to rapidly navigate report template fields, then record and use “voice fill-in” capabilities to sert recognized text into report template fields. By combining an ergonomic hand microphone with PC mouse functions, physicians will gain new levels of dictation speed, ease-of-use, and productivity. Note: Identical to Dictaphone model 0POWM2S-001, 0POWM2S-002, 0POWM2S-003 and 0POWM2S-004.